All handrail fittings and ramps are joined to handrails and each other using a dowel screw set. The dowel screw, locking nut and washer are dispatched together. 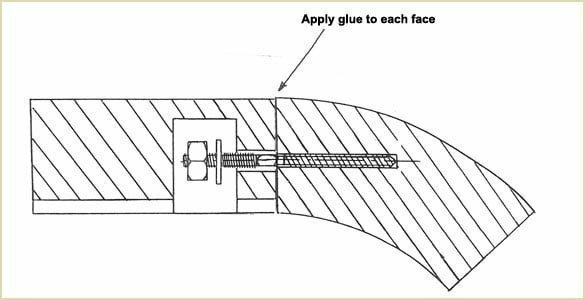 In the groove of preferably the straight component, drill an access hole 30mm diameter, 30mm deep and 35mm from the face to be joined. To look at purchasing theseparts click this button, and scroll to the bottom of the page for the accessories. You now need to drill the bolt hole into the end of this straight handrail. We recommend a 9mm diameter hole is drilled 20mm from the very bottom of the handrail. See below. The other component to be joined also needs a hole drilling at the exact same centre line, but this time only 6mm diameter and 40mm long, but again 20mm from the very bottom of the component. Ensure the drill is at 90° to the face. Screw the wood threaded part of the dowel screw into the 6mm hole to the full extent of the thread. 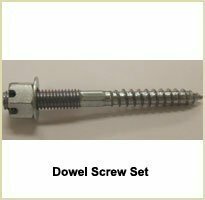 The centre of the dowel screw has a hexagonal flat face allowing mole grips to twist the screw in. You can now fit together the two component faces applying glue to each face. Secure the nut and washer to the bolt in the access hole. You can now tighten the locking nut using a spanner. If you can't get a spanner into the hole then you can use a screwdriver and a light tapping at the end of the screwdriver to secure the components. See belowfor a 3D view of the components. Pear Stairs sell handrail components in all shapes and sizes but remember if you have any questions don't hesitate to phone us about your handrail components, we are a very friendly company, phone Pear Stairs on 01938 553311.